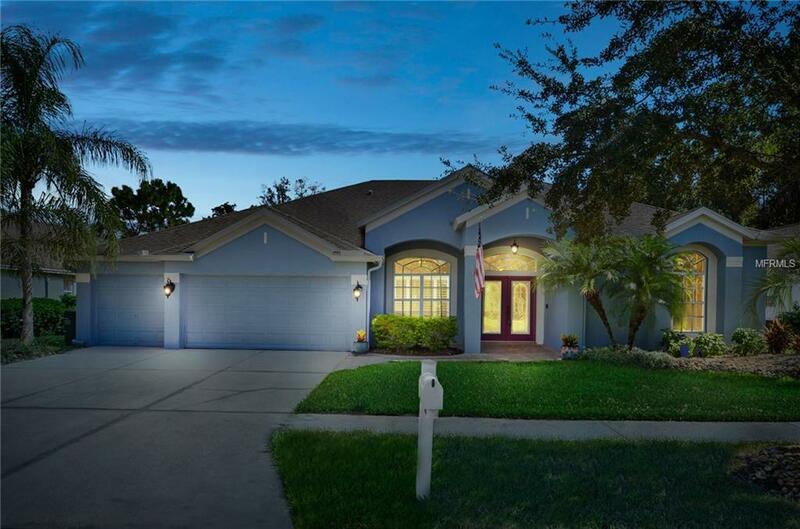 Situated on a pond with conservation view in the gated PREAKNESS village of the Lexington Oaks GOLF community, this POOL home boasts 4 bedrooms, 3 full baths, 2 half baths, formal living & dining areas, large family room, office & bonus room. Newly painted inside and out, this well-maintained home features ceramic tile in the main living areas, volume ceilings, and upgraded lighting. The den/office has built-in shelving and french doors. The formal living and dining areas are perfect for entertaining with butler's pantry and sliding glass doors overlooking the pool area. The master suite has beautiful wood flooring and sliders that open to the lanai, a large master bath with double sink, garden tub w/separate shower and big walk-in closet. Split floor plan with three more bedrooms in the back of the house allows privacy for all. The kitchen has been upgraded with 42" wood cabinets w/crown molding, granite countertops, pendant lighting, and overlooks the family room. Sliding glass doors allow tons of light throughout this home. Upstairs bonus room has a 1/2 bath and can be used as a 5th bedroom. Inside utility room complete with cabinets and utility sink. The beautiful lanai area features a pool & spa, pavers, and pond/conservation view. Fully fenced and lovingly landscaped yard. Complete home water purification system included! Conveniently located near interstate, hospitals, schools & shopping. Additional Lease Restrictions Please Verify Leasing Restrictions With Hoa. Pet Restrictions Please Verify Pet Restrictions With Hoa.